An eastern backhand grip (1) should be used. A lot of players move the grip over closer to (8) for more topspin, but the drawback of this is on the return of serve. You are able to hit both topspin and under-spin (slice) with one grip – the grip in the right side of 1 (Left side of 1 for lefty’s). Most players have two grips on the backhand. One-handers have the tendency to slice a lot of return of serves back. Most players wait on a forehand grip so when the serve goes out to their backhand they find the first grip which is usually somewhere between 2 and 1. As a result they have a weak backhand return. 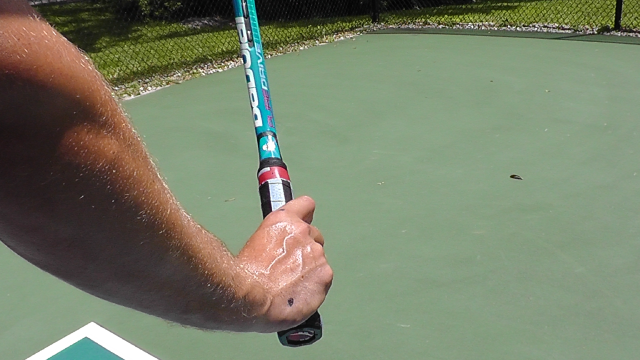 The beauty of one grip is that it allows them to hit a topspin return or a flatter return on the backhand. Two-handed players can get away with this a little easier as they can use their left hand to help drive through the ball. The ball does not know the difference between being hit by a forehand or a backhand. You want the shape of the swing to match the shape of the court. The singles court is less then 20 degrees wide, so you want a vertical lifting motion. As soon as you recognize that the ball is coming to your backhand you want to turn before it crosses the net. Early preparation is key to allow you to take the ball early and on the rise. It is CRUCIAL as a one-hander player to take the ball early to prevent it from getting up above your shoulder. You turn with your shoulders and racquet as a unit. 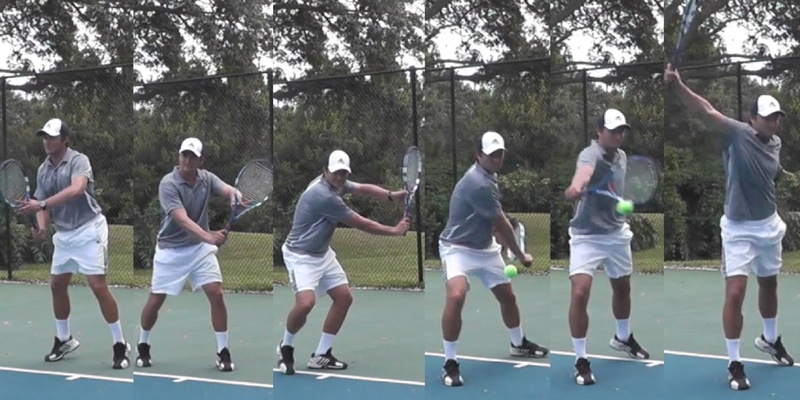 The shoulder turn is what gets the arm and racquet moving backwards. As you turn you simultaneously change your grip to the right side of 1 and almost straighten your right arm. The left hand should be positioned with the left index finger on the strings. The left elbow should be bent and raised. This will help prevent the racquet face from opening, facing the sky, and also help abbreviate the backswing. You should turn so much that the rear part of the hitting shoulder is facing your opponent. Ideally the racquet should free fall down to about your knees when the ball is bouncing so that you can swing up to the rising ball, therefore taking it early. The swing should go inside out. You should turn enough so that your racquet is close to your body so that you can swing away from you body to make contact. The body should be lifting, the center of gravity, the CG lifts at the hit. 1. Unit turn by the time the ball has crossed the net. 2. After taking multiple small steps to the ball, take a longer step out towards the ball, getting low with the body and racquet. Your thighs should be almost parallel to the ground and the racquet should be free-falling. 3. Lift at contact – your front leg should be straight. As a one-hander your shoulders should stay sideways. Ideally the only moving part should be from the shoulder lifting. The racquet should be forming a roof as you lift up. The wrist stays fixed – there should be hardly any wrist movement.